Housing estates have been an integral part of British life for decades. Many were built in the years after World War II to provide a better standard of living for millions of people. 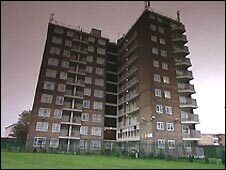 Some estates are success stories but others are among the most deprived places in the UK. The Seacroft estate in Leeds was begun in the post-War years. It has continued to expand and around 18,000 people now live there. Part of it is judged to be within England's 10% most deprived locations. Over the past two months, the BBC's Nicola Pearson has been spending time with people who live and work in Seacroft. These are some of their stories. Seacroft's new secondary school is the David Young Community Academy. Some of its pupils come from deprived backgrounds, but principal Ros McMullen has high ambitions for every child. Philip Stead runs the butcher's shop in Seacroft. He says he's seen a drop in trade as homes fall into disrepair and people move out of the area. Pensioner Dorothy Wall has lived in one of Seacroft's high-rise blocks for 25 years. She is fiercely proud of the estate and its community spirit. Many young people on the estate complain there isn't much to do. Youth workers Claire Billingham and Ian Wigglesworth run projects aimed at getting local teenagers off the streets at night. The Seacroft Working Men's Club has 4,000 members. It is busiest on Friday and Saturday nights when people go to drink, socialise, play bingo and watch local acts perform. Gina Morrison lives with her husband and four children in a three-bedroom house. It angers her when people refer to where she lives as a "sink estate".